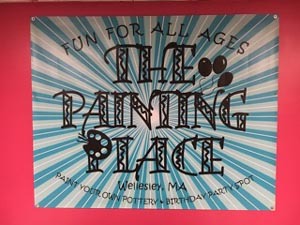 The Painting Place (formerly Kids Place 4 Fun) is a fun, creative, interactive art studio for children of all ages. Make a gift or make something special for yourself. Paint Pottery; Plaster or Canvas; Make Candles; Mosaics, Make Slime & Mine for Gems; Birthday Parties; Workshops; Vacation Camps. Walk-ins always welcome!! The majority of our projects choices consist of useful items. Plates, bowls mugs and more! Most are food, dishwasher and microwave safe! You can drop in 7 days a week 10am - 6pm. Drop in or Party. Paint Pottery, Plaster or Canvas. Create Candles, Mosaics and mine for gems. For more information, check availability, or to book your party now. We provide the entertainment/project and we clean up the mess!! All parties include one of our 6 main Project choices (Paint Pottery; Plaster or Canvas; Make Candles; Mosaics; Make Slime & Mine for Gems) PLUS Freeze Dance (disco ball and all), Face Paint/tattoos and use of our selfie station. There is no right or wrong way to create art :) Come in to have fun, be creative make the mess here! Call, email or visit our website with ANY questions. Projects Start at 9.99. For further pictures and pricing click here www.kidsplace4fun.com. Prices are all marked as priced there is no additional cost or studio fee. We are now located at 380R Washington St., behind where White’s Bakery at Playhouse Square. I took my kids to The KIds Place for an afternoon of fun!! They painted mugs for there teachers and mined for gems...It was a BLAST. Not over priced at all, the mugs will be glazed and fired to be dishwasher, microwave safe- extremely practical gift!! The staff was amazing they helped with handprints, and have an area for little ones to play. My older daughter took a long time painting, so my younger child played with the toys and had a slush- They have slush and cotton candy as well!! I can't wait to go back to make Father's Day gifts!!! After having the best b-day party ever for our 5 yr old, my wife and I made The Kids Place a weekly family activity. It's a fun, friendly, safe enviornment which so much to do. They have so many activities for all ages (ceramics, plaster, mosaics, stuffing animals and mining for gems in the CAVE). It's a great, family place.